This week, Italy is enjoying its annual Sanremo Festival. Just like in previous years, the winner gets the chance to represent Italy at the Eurovision Song Contest. In this post, we give you the latest updates of the Sanremo 2019 Festival. Should the winner on Saturday decide not to go to Tel Aviv, broadcaster RAI will select another act for Eurovision. There are 24 acts in the Campioni section. There is no special category for young upcoming artists anymore. 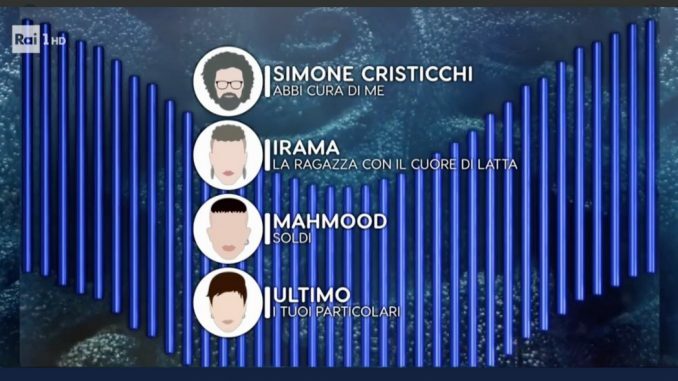 They took part in their own festival in December, and two winners (Einar and Mahmood) will take part in Sanremo 2019. Notable big names in the line-up are Il Volo (ESC 2015), Nino D’Angelo (ESC 1989) and Nek (Sanremo 1997 and 2015). On the first night, candidates will present their songs. Subsequently on night 2 and 3, a jury will rank the songs. However, there will be no eliminations yet. Friday the songs will be aired together with a guest performer. On the final on Saturday, the 24 acts will perform once again, until we get a top 3 for a superfinal. The other 12 candidates got back on stage to perform their songs on Thursday. Once again, the 12 acts were devided into three groups: The blue zone for the four best scoring acts thus far,the yellow zone for the middle group and the red zone for the lowest scoring acts. There are no eliminations yet, but the results will be taken along to Saturday night. 12 candidates returned to the Sanremo stage on Wednesday to perform their songs again. At the end of the night, the jury split them into three groups: Blue (top group), Yellow (middle group) and Red (lowest scoring group). 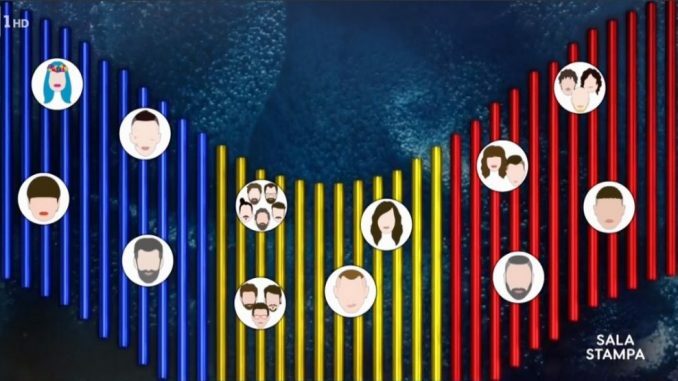 Surprisingly, Nek ended up in the red group and Il Volo in the middle, yellow. No act will be eliminated yet, all results will be taken along to Saturday night. In the final on Saturday, the best three acts will advance to a superfinal.